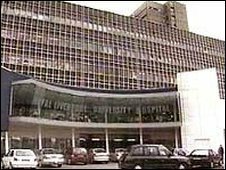 The personal details of more than 300 people waiting for kidney transplants at the Royal Liverpool Hospital have been stolen from a car. The information was taken from the locked boot of a car belonging to an on-call member of the transplant team. The Royal Liverpool and Broadgreen Hospital NHS Trust said it had written to all patients involved and had set up a helpline to answer any concerns. Merseyside Police have been informed and are investigating. The information included the names, addresses, date of birth, hospital number and contact details of 354 patients on the renal transplant list. Dr Peter Williams, medical director at the trust, said the incident was "regrettable". "We are concerned for our patients and are currently working closely with them and the police to resolve this," he said. "We have already reviewed procedures and put new measures in place to prevent an incident of this nature happening again. "A review of the use of encrypted electronic devices by staff who need to carry patient information as part of their job was already under way at the time this happened." He stressed the incident would not affect transplant selection procedures at the hospital. NHS North West, UK Transplant Services, the Information Commissioner and the Healthcare Commission have been informed.